For years, the company JAB Holding has been working to make sure one of their brands delivers your caffeine fix each morning. Since 2012, it’s been snatching up coffee companies big and small (Peet’s, Caribou, Stumptown, Intelligentsia, Keurig, Krispy Kreme, Einstein Bros., Panera, Au Bon Pain), with seemingly no endgame other than owning a lot of companies that might otherwise be in competition with one another. 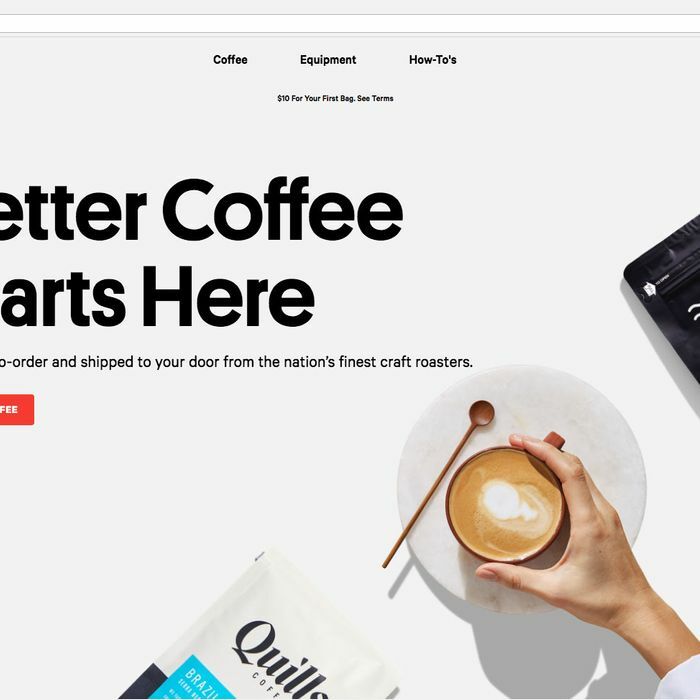 Today, however, JAB gave the first sign it’s trying to actively disrupt the coffee industry: It’s unveiled a new retail site called Trade that focuses on craft coffee the way, say, Etsy specializes in handmade home décor or Zappos sells shoes. So why is JAB suddenly so interested in fancy coffee? There are great coffee shops all across the country, and the people at Trade argue that market may be tapping out, yet somehow better coffee still “has not made it to most American homes.” If Trade hopes to succeed, its operators would do well to remember the plight of Starbucks’s web shop: The coffee giant’s online store closed last fall, but it’s worth remembering that even at its peak, the site sold no more than several dozen Blonde, Medium, and Dark roasts and Reserve single-origins. Most cost nearly as much as Trade’s ridiculous number of options (around $15 to $20 a bag), yet all carried Starbucks’s telltale notes of bitter charcoal. Worse, bags would frequently arrive stamped with use-by dates that were months, sometimes years, away. Trade, meanwhile, promises to offer a roast-to-order guarantee, meaning your beans will ship direct from the coffee company within 24 hours of roasting.